Several weeks ago I took the plunge and upgraded my work laptop to run Ubuntu 11.10 and after switching to Gnome Shell, all has gone well and I've grown accustomed to the way Gnome 3 works. One thing that hit me when I initially upgraded was the way the proxy settings are configured and used by Ubuntu 11.10 seemed a bit broken. The "system wide" settings weren't taking effect as they used to in Ubuntu 11.04. After a fair amount of hacking around and changing individual applications to use their own settings instead of the centralize setting, all was well. Until this morning. Note the message at the bottom of the window... "Unable to process response from...". Not very useful at all. A quick search around Google revealed nothing. I downloaded and re-installed the client. No go. By now, I'd wasted about 30 mins and was now technically late for my shift, so I quickly installed OpenConnect and it worked a treat and worked all day. Performance was a bit poor at times, but I don't know if that was OpenConnect, work or my broadband. 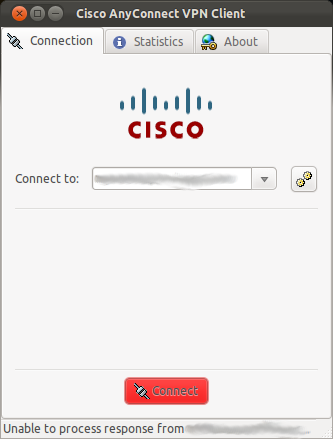 Cisco AnyConnect VPN Client (version 2.5.0217) . >> warning: No profile is available. Please enter host to "Connect to". >> notice: VPN Service is available. >> warning: Unable to process response from my.vpn.servername. >> error: Connection attempt failed. Please try again. Huh?? It's attempting to resolve the proxy hostname (obfuscated to hostname.uk.domain by me) which means it's trying to connect to the proxy. Why is it trying to connect to my proxy? To try and connect to https://my.vpn.servername. Sure enough, unsetting the https_proxy environment variable from the command line allowed me to connect using the CLI invocation of the client. Now when I start the VPN client via the GUI, it unsets the proxy just for that shell and we're A-for-Away and I can connect. I know I could just disable the proxy configuration and initiate the VPN connect, but once I'm connected to the VPN, I'd need to re-enable it again. Seems like a waste of time to me when I only need the proxy disabled for a moment. I have no idea what Ubuntu has done with the proxy configuration in 11.10, but all I know it it's far from perfect and I was definitely not expecting it to be the culprit here.